I’ve never been to the United Kingdom; the closest I’ve come, by which I mean Queen Elizabeth II is its monarch, is Canada. It was thus a bit surprising that my first stop in the UK was Scotland, which in 2014 narrowly avoided voting to separate from the United Kingdom. With no personal preference on the topic myself, I looked forward to the trip for a few reasons: I could try my ear against the Scottish accent; distillery tours were planned; and the landscapes I had seen of Scotland were enchanting, perhaps on a level with those of Norway. 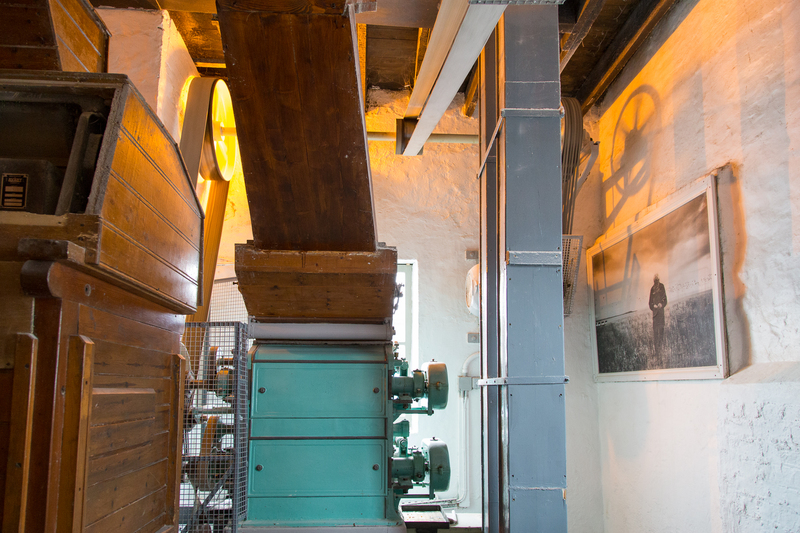 Landscape photography turned out to be challenging, but the distillery tours were an educational introduction to whisky production. Until recently, I hadn’t really tried Scotch whisky (I’ll refer to it simply as “whisky” from now on out) and therefore the idea of visiting a distillery, much less multiple, had not been on my mind in the past. However, as a friend introduced me first to a Speyside and as I grew quite fond of a certain Islay (pronounced “eye-lah”) whisky the number of possible distilleries to visit while in their namesake country suddenly seemed daunting. My friend’s trainee rotation — one station in the same program I had done in 2011 — coincided conveniently with my time in Germany, so Scotland as a destination with an occasional focus on distilleries emerged and strengthened as an idea. The first, Glenfiddich, was arguably the most seamless. Our tour guide (Lorna) was knowledgable about the process and about Glenfiddich, and the tour was rather unique in its showing the entire process from milling to maturation. Photography was also allowed in nearly all areas; by contrast, Aberlour, Lagavulin, and Talisker were not so forthcoming with picture-making. The reason given, including at non-photography areas of Glenfiddich, was typically “volatile vapors.” Glenfiddich is the best-selling single malt (which today means only that the whisky comes from one distillery, not that it was matured in one barrel) Scotch whisky and the number of pot stills in the stillhouse reflected that status: its two stillhouses seat somewhere around thirty pot stills. 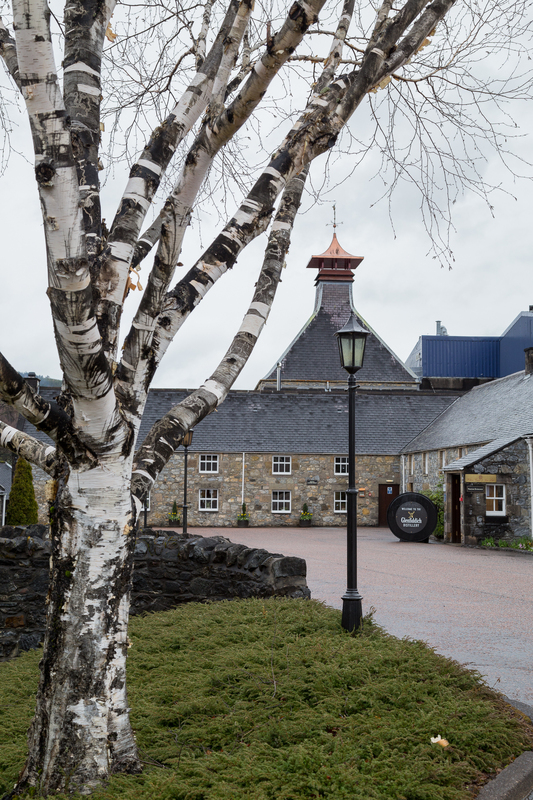 The visitor center of Glenfiddich was recently renovated, and overall the tour came off professional and confident — a good first exposure to the process and to the world of whisky. The aforementioned Aberlour didn’t allow photography inside its buildings, but our last tour of the first day, Glen Grant, did. The tour guide there was friendly and entertaining and even allowed visitors to take photos where Glenfiddich did not. 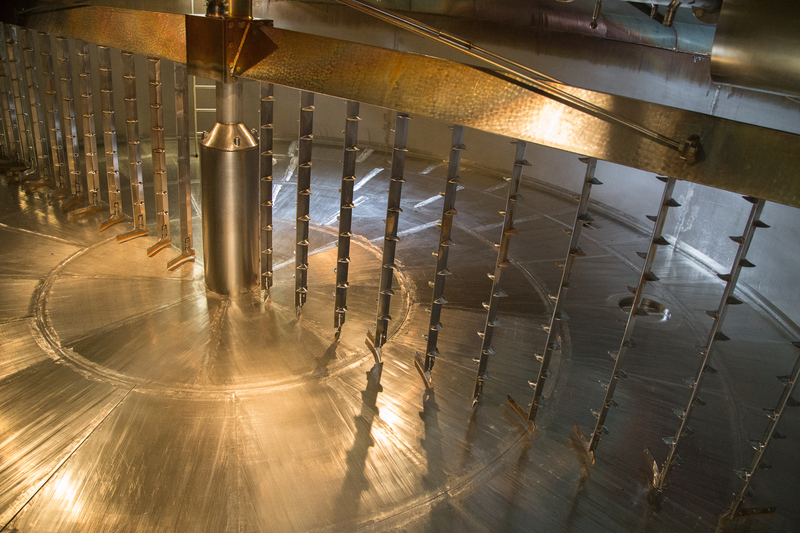 One of the mash tuns had just emptied its wort and was sitting clean, waiting for its next grist — it was neat to get a look inside. After three tours, must of the distillation process looked the same, but seeing pot stills was somehow still exciting. 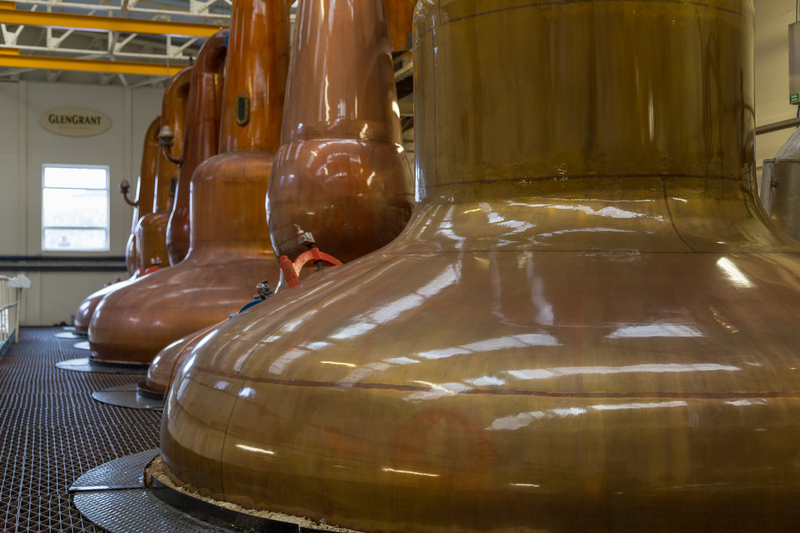 There is a not-small amount of pride behind pot stills, so as lifeless as these are they are typically the highlights of the tour. 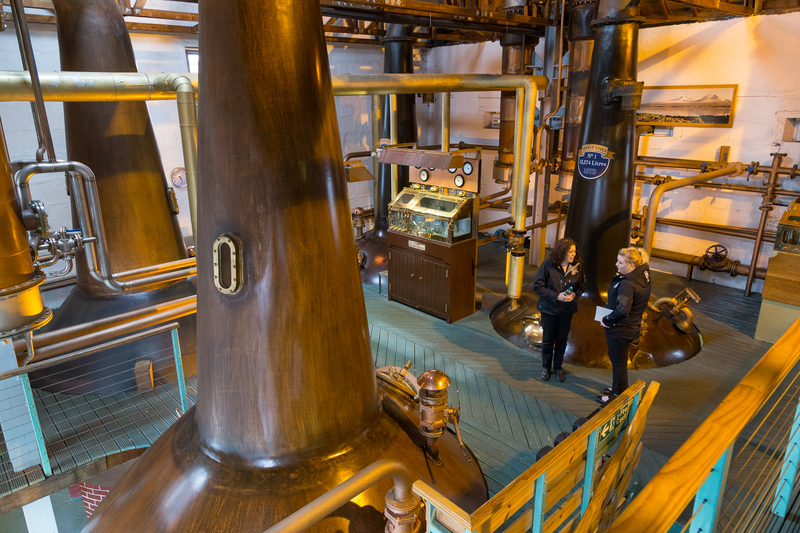 Since they weren’t distilling any spirits, even neater was being able to see the stills at Glen Grant up close and personal. 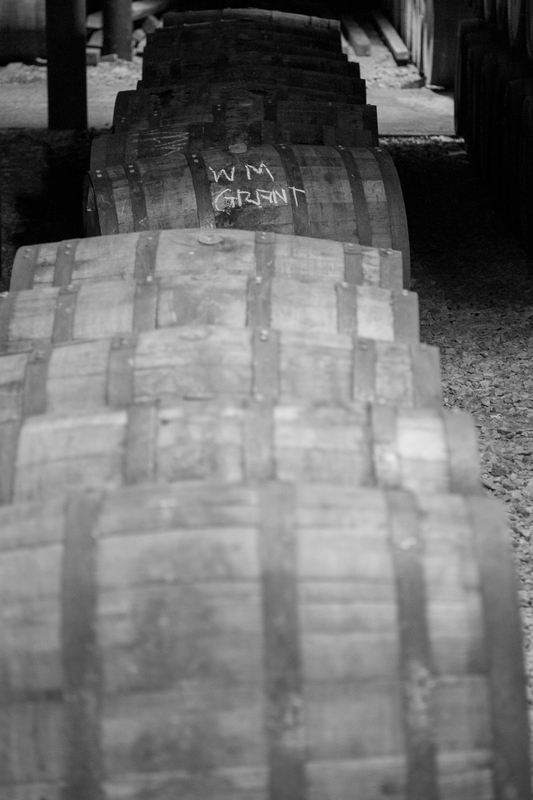 Glen Grant also allowed a peak (and photographs) of its warehouse, where whisky was sitting in casks to mature. Some whiskys age for more than a decade, with some approaching two. Planning a business around a product that won’t be on the market for that long must be a daunting challenge! 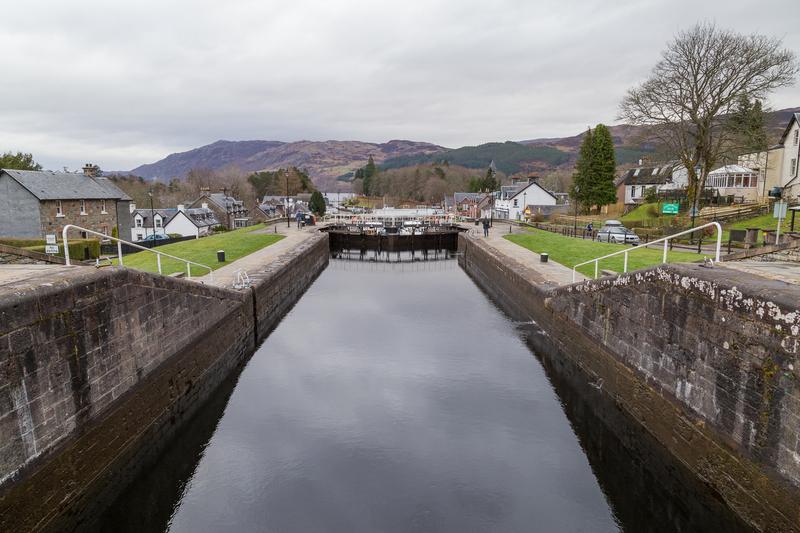 After getting a repetitive and ultimately informational exposure to how whisky is distilled, we spent the next day on the road, starting in Fort Augustus at the tip of Loch Ness and heading south. This city gave me a new respect for a Dorf (German for village, though for emphasis, German for a really, really, really small village): its population is about 1% that of Kempten’s. The locks here connect Loch Ness to Inverness at the nothern end of the loch. 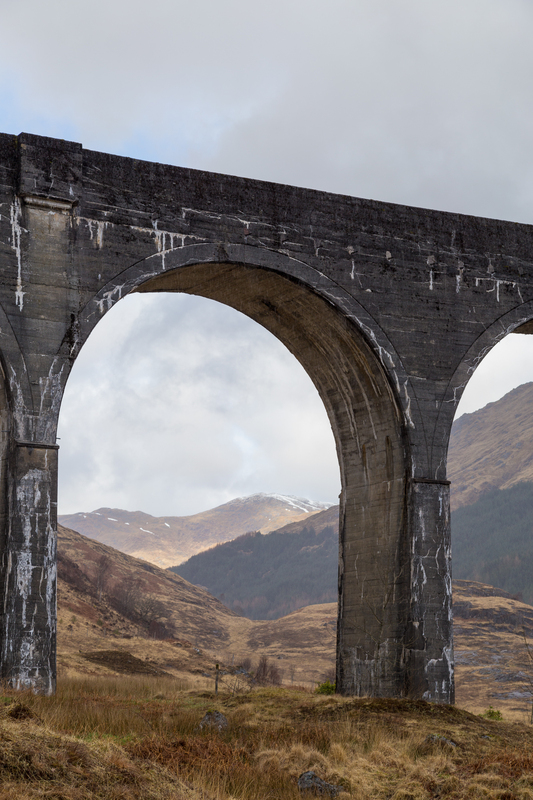 Not far away from Fort William is a road that leads to Glenfinnan, home of the Harry Potter Bridge, which I’m sure has a proper name in the books. 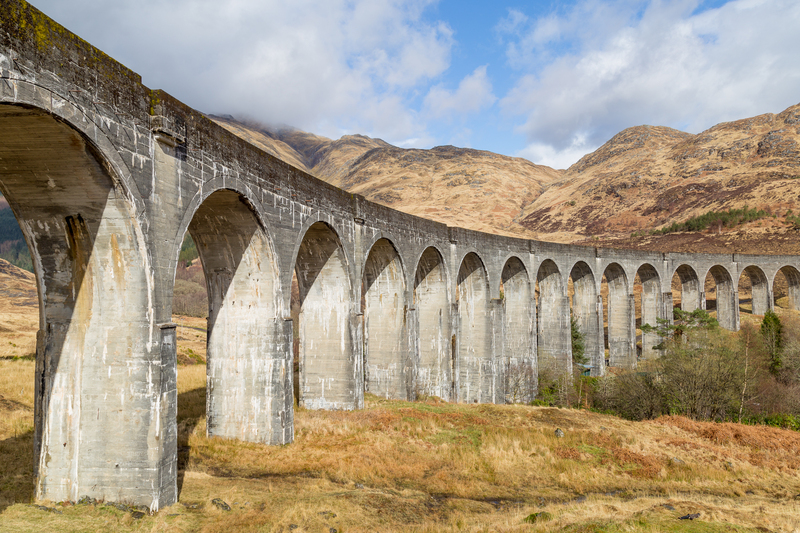 In real life it’s known simply as the Glenfinnan Viaduct. The steam train wasn’t running when we went, but even without its locomotive the viaduct was surprisingly photogenic. The hills at its two ends would have given endless more photo opportunities if time had allowed. Part of the charm of Glenfinnan that day was the fickleness of the weather. While we were there, we saw rain, sun, clouds, blue sky, grey sky, shadows, no shadows, and a tiny rainbow in the span of about an hour. I had seen photos of sunny Scotland and heard about its transient weather, but until Glenfinnan I had never experienced such quick and indecisive meteorological changes. On the road after making it back to the car before a sun shower, we drove toward Glencoe, home of an also-photogenic Loch Achtriochtan. There, the sun and blue skies largely disappeared, replaced by clouds, wind, rain, and more rainbows. The first photograph of this post was made there, but driving even a few kilometers away would result in a brief clearing followed by more raindrops. 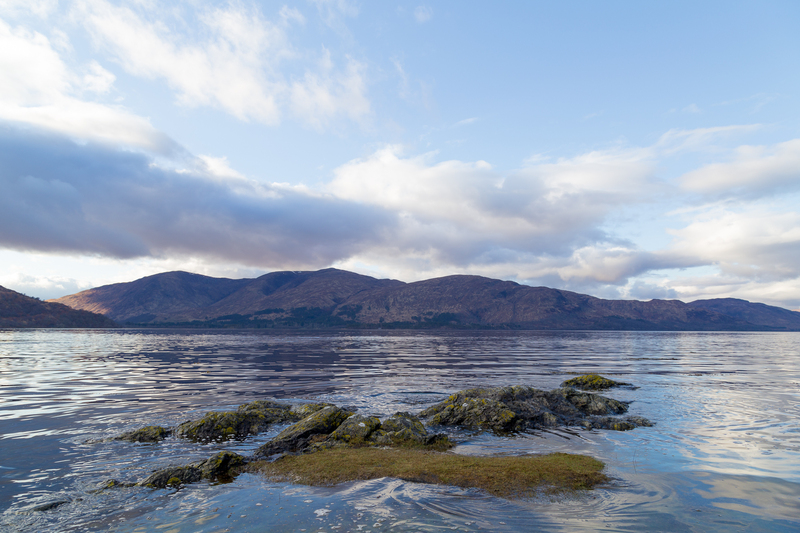 Around Loch Linnhe, less than eleven miles from Loch Atriochtan, the skies cleared and stayed clear for the rest of the evening. The next days, the rain came and went. 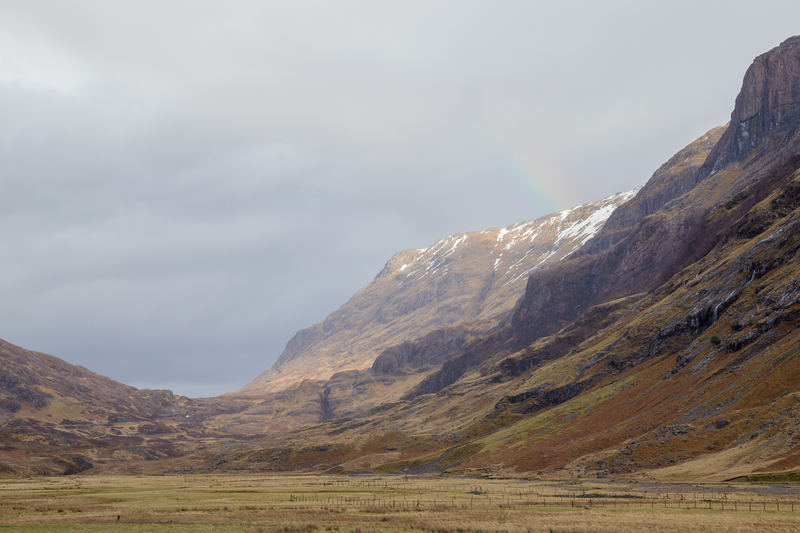 Half of our trip was spent on the Isle of Skye, an impossibly dazzling island landscape of high mountains, flat valleys, cliffs to the sea, and sheep. 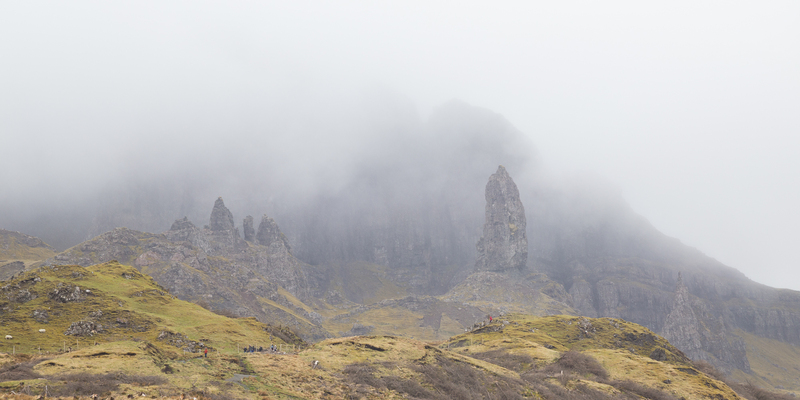 When we left the Highlands for Skye, weather conditions were favorable but gradually deteriorated, changing to a constant rain by afternoon and continuing into evening. 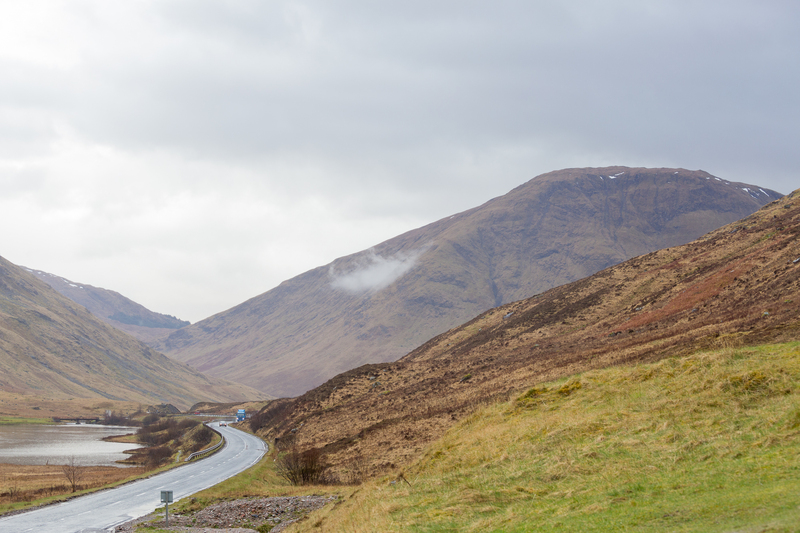 Driving in Scotland takes far longer than the distances would indicate between singletrack roads (i.e. one-lane roads with pullouts every few hundred feet to allow for passing), sheep, and incredible sights, but with the incessant rain we rarely stopped for photography. In between downpours we ran up toward the Old Man of Storr, which may be familiar due to its being the background in Prometheus, but stopped short of continuing to a distant summit for the uncertainty of and aversion toward getting soaked were the skies to reopen — a good choice, as it turns out, as reopen they did about two minutes away from the car. 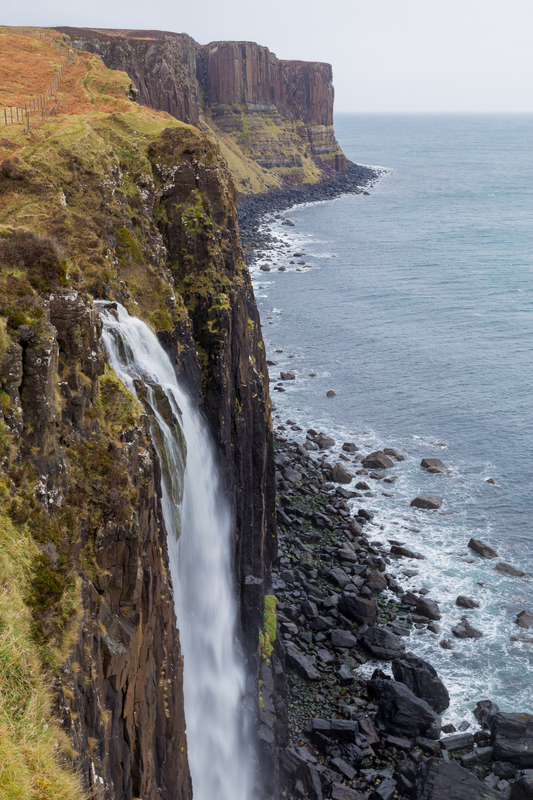 A long ten miles away from The Storr is a viewpoint that overlooks Mealt Falls and Kilt Rock. Kilt Rock, upper center below, is named for its resemblance to the garment while the falls are fed by a loch of the same name. The recent rain kept the falls flowing at a mildly loud roar. After touring the Isle of Skye, my friend returned to Germany but I continued on for two more days to travel to and visit the island of Islay. Home to the distillery of my favorite whisky and seven others (a rumored ninth is coming), I realized too late I could have spent a full week on Islay itself. The geography and rawness of the island aside, the distilleries I visited there were unique from what I had seen in the Highlands. Bruichladdich, for instance, closed down for about seven years before reopening in 2001. 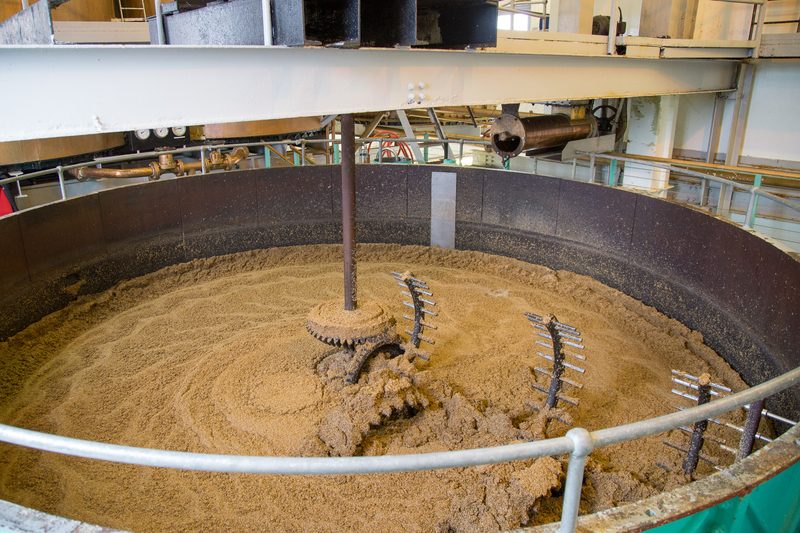 In its shuttered state, it managed to keep its old belt-driven mill and an open-top mash tun, one of few in the world. 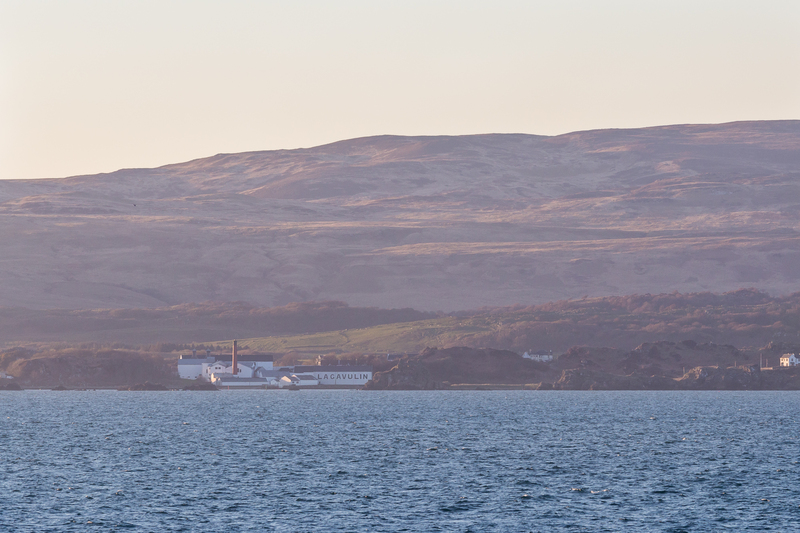 The blue-torquoise of the mill and of Bruichladdich bottles is said to be representative of the blue waters around Islay; it’s downright impossible to fathom without seeing the water in person, but having seen both it’s truly not far off. Compared to the twelve or thirteen pot stills inside Stillhouse 2 at Glenfiddich, the stillhouse at Bruichladdich was paltry, with just two wash stills and two spirit stills. However, one of these — the one hidden in the corner below — is from 1881 and believed to be Scotland’s oldest pot still. 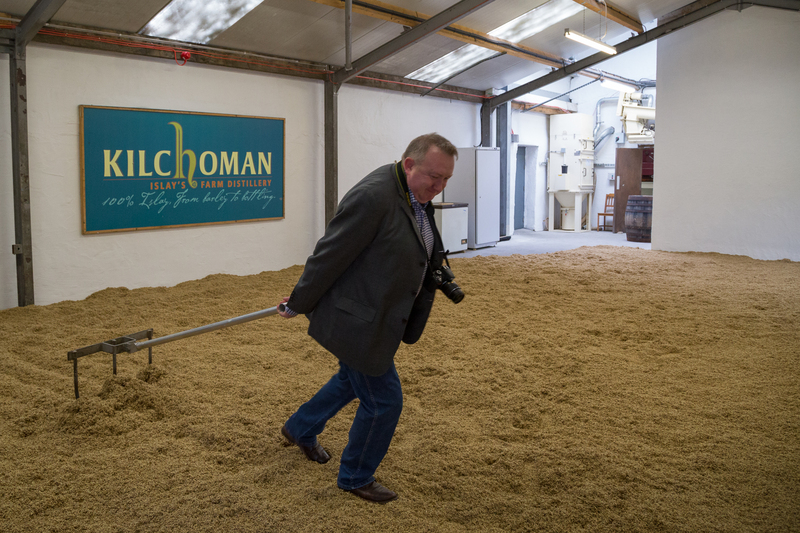 What is not so old on Islay is the Kilchoman distillery, which opened in 2005. 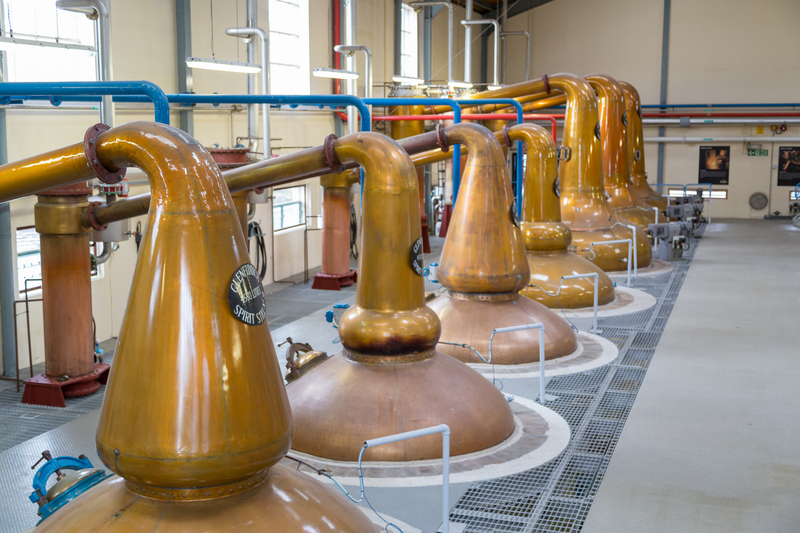 It is the only Scottish distillery that can claim to grow its own barley, run its own malting floor, do the whole whisky distilling thing, and bottle on-site. Seeing a malting floor was a bit eyebrow-raising — it’s not what one would expect to meet health code at first glance — but it was a fascinating experience to see the process of barley germination, which prior to this tour was a process unseen at any of the distilleries I had visited. 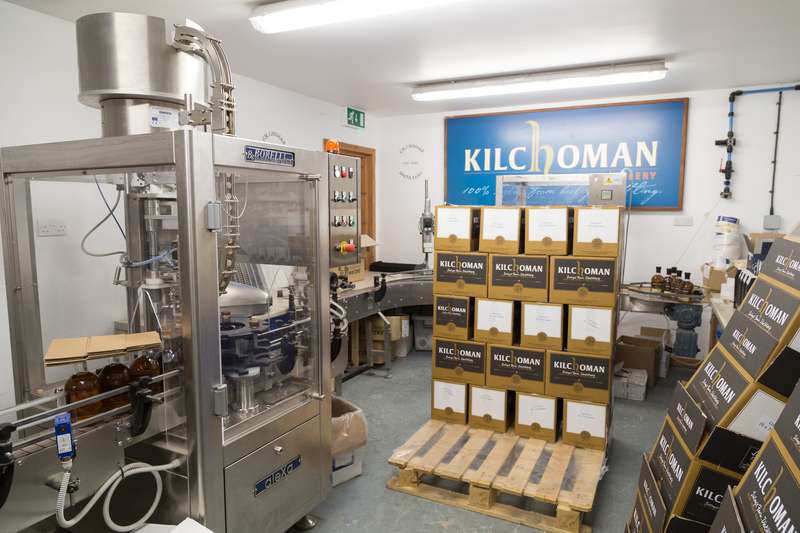 I was mistaken about the small stillhouse at Bruichladdich, as the one at Kilchoman is smaller yet. At the moment, they have one spirit still and one wash still. The bottling operation is done entirely at the distillery, which is also unique — we could see the bottling operation at Glen Grant only from an observing room above; the other distilleries didn’t show the bottling during the tour or bottled their spirits off-site. Unfortunately, the operation wasn’t running when I was there. The manufacturing engineer in me wanted to see how this all ran! After a lunch at the Kilchoman cafe, I headed back toward Port Ellen. After months of planning and replanning the Scotland trip, this was the distillery I had been waiting for: Lagavulin, whose 16 year malt, brooding and smoky, almost seems to encourage introspection. Located on the shoreline of Islay with rolling hills rising behind it, the iconic black letters on the white building are visible only from the sea. 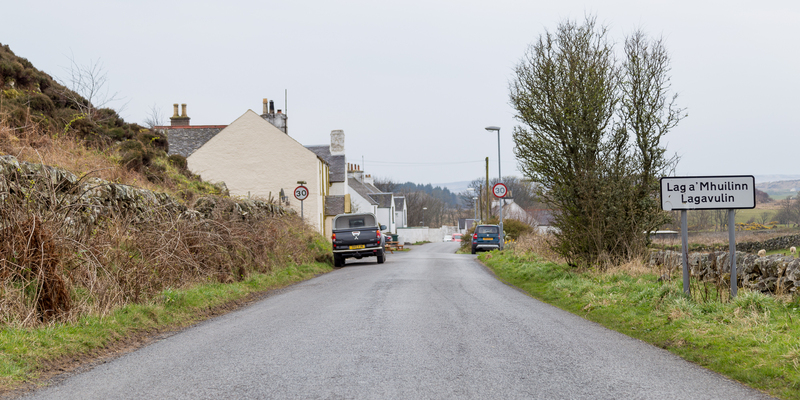 The town that bears the name of the distillery, meaning “hollow by the mill,” is tiny, comprising perhaps five houses that all but blot out the distillery. Not unfitting for a brand that hardly needs to advertise and that isn’t as well known as some of the big names: The Macallan, Glenfiddich, Glenlivit, even its neighbor Laphroaig. The tour wasn’t much different from that of the other six I had seen, but seeing the spirit being produced was nevertheless rewarding and a pleasant, smooth close to what had been an incredible seven days. I had braced myself to have challenges with driving on the opposite side of the road but this didn’t turn out to be much of an issue, my left hand having a really difficult time finding first gear in the rental Kia aside. I expected to be frustrated by trying to understand Scots speaking English — it was always the hardest of the English accents to comprehend for me — but I understood far more than I had anticipated. I even breathed a sigh of relief that the time away, speaking English all the while, didn’t seem to have an effect on my German after my return. The only missing aspect from the trip was something I had blindly assumed would be pervasive on the Isle of Skye: sweeping landscapes, rich green fields and blue skies, mountains, slopes rivaling those in the Allgäu, windy roads from sea to summit. The rain initially swallowed these into an unknown and unseen oblivion, but it wasn’t until after getting home, processing photos, and contemplating the trip that the undeniable beauty of this wild country began to shine through in a way I had not envisioned before or during traveling. I have tried affected speaking, throwing my voice to the back o’ me throat and – to me – it sounds very Scottish. Meaning almost unintelligible. Haha. Raj pushed our time in Paris to late June (hot weather and crowds?) so we would transition to Scotland the first of July, during – hopefully – the brief best time for sunny skies. We’ll see. During a long Easter break when I was in college, my roommate and I both could not afford to go anywhere. The faculty had had a going-away party and, at the conclusion, had stashed almost a full case of Cutty Sark Scotch (https://www.thrillist.com/vice/the-best-whiskey-ads-of-the-1960s) in my basement photo darkroom. I was on a photo scholarship as the young school’s first official photographer and had set up a b&w darkroom. He and I drank about 7 or 8 fifths during the week of Easter. Neat, on the rocks, with a splash of water and, I vaguely recall, even with some Pepsi. I have not had even a wee dram of Scotch since then! Scotland is undoubtedly and undisputedly beautiful with sunny skies, but there’s something also when it is cloaked that is also somehow appropriate. Best of luck for good weather nonetheless on your trip! 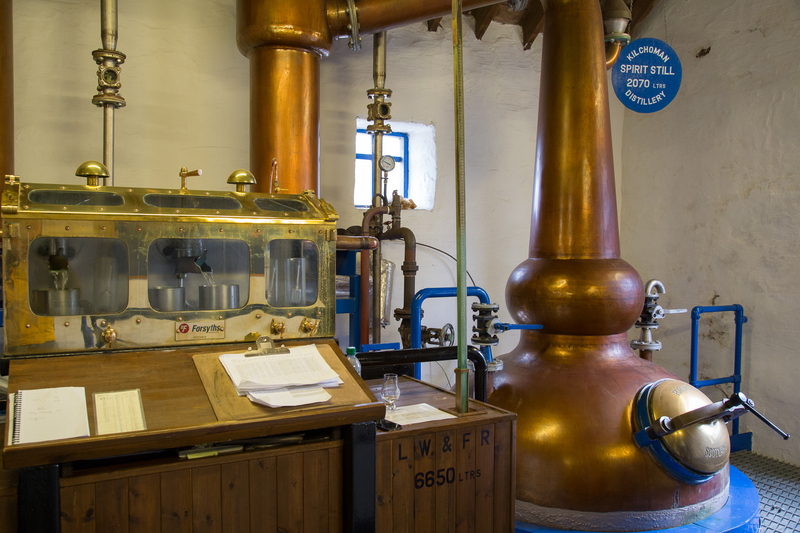 Even if you don’t do the tasting, there are some really good distillery tours out there. Glengoyne (north of Glasgow) is one not far from Edinburgh that I’ve heard good things about.